Local singing icon Melveen Leed is this month's featured performer at Waikiki Beach Walk's Na Mele No Na Pua Concert. The "Molokai Tita" will take the stage at the Beach Walk's Grand Lanai starting at 4 p.m. Saturday. Early on in her career, Leed won the Na Hoku Hanohano award in 1976 for best female vocalist. Two years later, she again took the top honor for her song "I Love You Hawaii." Now in her 60s, Leed remains one of Hawaii's ambassadors, proclaiming the history and culture of our people through her songs. Her diverse musical styles, ranging from jazz to country and pop, have made her one of the state's premier performers. The holiday concert is free. Valet parking for up to four hours is available to concertgoers for $6 at the Embassy Suites-Waikiki Beach Walk (201 Beachwalk) and the Wyndham Vacation Ownership-Waikiki Beach Walk (227 Lewers Street), with any same-day purchase from any Waikiki Beach Walk merchant. Future concerts on the last Saturday of each month will feature Ledward Kaapana (Jan. 26), Kuuipo Kumukahi (Feb. 23) and Willie K. (March 29). Our own ukulele virtuoso Jake Shimabukuro is spending the holidays at home, but that doesn't mean he is taking a break from performing. He and his equally skilled backup rhythm section of bassist Dean Taba and drummer Noel Okimoto are putting on a series of concerts called "Under a Christmas Moon" Thursday through Saturday at the Cupola Theatre on the second floor of the Honolulu Design Center on Kapiolani Boulevard. It should make for an entertaining mix of standards and originals to help celebrate the holiday season. Jake's brother Bruce and the Ukulele Essence Band will also be guests. Plus, oh boy, all-you-can-eat pupus! The shows start at 6:30 p.m. with $35 general admission and $15 for children under 12. For more info and tickets, call 737-9431 or visit www.jakeshimabukuro.com. Those who love shiny objects can head for the Gem Faire Friday through Sunday at the Blaisdell Exhibition Hall. An international selection provided by 30 dealers will offer fine jewelry, gems, beads, crystals, minerals, findings and jewelry-making tools, for those who make jewelry and those who just want to wear it. Classes and demonstrations will be offered in beading, wire-working, bead stringing and stitching, and chain mail. Admission is free. Hours are from noon to 6 p.m. Friday, from 10 a.m. to 5 p.m. Saturday and from 11 a.m. to 5 p.m. Sunday. Visit www.gemfaire.com, call (503) 252-8300 or e-mail info@gemfaire.com. Just because school is out for the holidays doesn't mean learning has to stop. The Waianae Public Library is presenting its winter break children's reading program, the "Twelve Days of Christmas," beginning Friday and running through Jan. 11. This free three-week program is for children in the Waianae community in kindergarten through grade 6, who are invited to participate and keep their minds active while earning cool reading incentives, as well. Requirements and grade level categories include reading 12 easy picture books or fairy tales (kindergarten through grade 3), and reading 12 juvenile fiction or 12 juvenile nonfiction books (grades 4 through 6). Books must be borrowed from the Waianae Public Library. Visit the library to sign up and receive a reading log at the Children's Reference Desk. The last day to submit reading logs and receive reading incentives is Jan. 13. The library is located at 85-625 Farrington Highway, next to the Waianae Fire Station. For more information, call 697-7868. Anyone who has dined out in the past couple of years knows that prices from 2006 to 2007 have increased tremendously, a reflection of higher mortgages/ rents, and fuel and water costs. The new year, 2008, is bound to hit you even harder in the wallet, as we experience the fallout of this financial crisis. It's enough to force diners to stay home, cook rice, but how much fun is that? Plus, it's not easy to do when you're working longer hours to pay for the same rate increases at home. Enter Clyde's Cafe, owned by First Insurance Co. The employee cafeteria is also open to the public, and due to the magic of subsidized rent, is able to roll prices back to about 1980s levels. I can't remember ever seeing a three-egg omelet for Clyde's price of $3.95, served with fried, white or brown rice. The catch is that only one kind of omelet is offered weekly, so you don't get the variety of a mainstream restaurant. Starting Monday, corned beef hash omelet will be on the menu, with a French toast omelet offered New Year's week. Listen to a recording of breakfast and lunch specials by calling 527-7786. 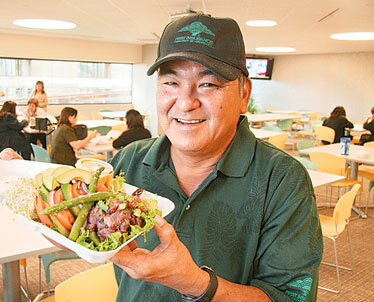 Clyde Oshiro, owner of Cyde's Cafe, serves up a poke salad with fresh asparagus. Decor is pure cafeteria, and local-style family fare prevails. Two hot entrée specials are offered daily on a two-month rotating basis so people don't get tired of repeats, though 60 days is a long time to wait for favorites to return. Wednesdays, or "carve day," is the exception. Its carved meats are on a three-week rotation. This week, roast sirloin was on the menu, and the day after Christmas, it'll be baked ham, followed by roast turkey. They also present an excellent Lite Gourmet stir-fried poke salad ($7.90) that is excellent. Some weeks you might find a Lite Gourmet salad that layers greens with red onions, mushrooms, asparagus, tomatoes and cucumbers and slices of broiled New York steak. You'll undo the light factor by seizing on desserts of homemade malasadas (50 cents) on Thursdays, and often, Dutch apple squares ($1.75).